Vintage doesn't get much better. 2009 Topps Magic is a modern take on the legendary 1951 Topps Magic Set. 09' Magic is the first ever collegiately endorsed pro product, featuring past, current, and future legends in their college uniforms. It treats every player like they never played a down in the NFL. 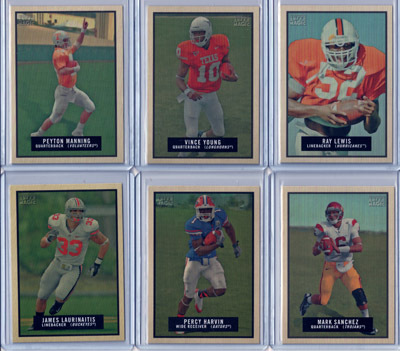 Topps Magic is the ultimate product for collegiate collectors. The Base Set is cheap to put together and semi-challenging. The Mini Set is also fairly cheap, but a bit more challenging to put together. For the high-end collector, the 250 Card Auto Set is the ultimate challenge, but well worth it, it's one of the coolest auto set of all-time. With names like Bo Jackson, John Elway, Adrian Peterson, Peyton Manning, Mark Sanchez, and Percy Harvin, you can't go wrong! Like Topps Magic, National Chicle is one of the best vintage football products ever made. What makes National Chicle unique is that the "card art" is actually "art". Each picture was hand painted by artists from other walks of life, such a comics and video games. 2009 National Chicle is like walking through a Football Museum. The box toppers are actually worthy of framing, that's how cool looking this set it. The base set and mini sets are well worth putting together. The non-auto insert sets are also cheap and easy to put together. The auto set is small, 63 total, which makes it more do-able that the Topps Magic Auto Set. No one ever thinks of putting together "relic sets", the National Chicle Relic set is small and I've seen relic lots go for $1-$5 on eBay! How cool would it be to put that together! 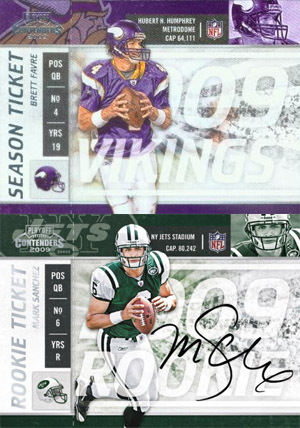 Cards #59, #99, and 191 are in the mini-set only. On a yearly basis, this is most coveted set on the planet. If you can afford to drop $1,000-$5,000, then this is definitely a challenge worth undertaking. The great thing about Contenders is that all the Rookie Auto's are part of the base set, meaning they qualify as rookies! Also, be prepared to spend a lot of money on players like Tom Brandstater, Aaron Kelly, and other Short Printed Rookie Autos. The great thing about Contenders is that only 21 people will be able to put it together, due to the fact that Aaron Kelly's Rookie Auto was only printed 21 times! Every Relevant Rookie Has Auto in Base Set! 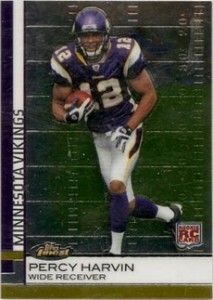 Finest is one of the most underrated sets of the 2009 Football Card season. The base cards are among the "Finest" looking cards to release this year. If you can't afford to put Playoff Contenders together, Finest is far cheaper. The reason is simple, every rookie is represented in the base set, just not all rookies have an auto in the base set. Players like Percy Harvin and Beanie Wells do, while players like Mark Sanchez and Matt Stafford do not. Instead of forking out $100-$400, you can grab their Base Finest Rookies for under $10. Although each rookie Auto is considered a Short Print, the lowest print run is 187. These two factors makes the Finest Set attainable to the every day collector who is willing to do the leg work. Not a comment, just a question. Hope you don’t mind. I just started collecting, and started buying 09 UD. I came across the Jay Cutler card and its a mis-print. Its numbered as #63 ( so also is the Kyle Orton card) Its a picture of Cutler, but the card emblems all mare Bronco. Is this the case with every Cutler card? Did they fix the issue? Is this card worth more or less due to the mistake…Okay, I guess a couple questions. As i said I’m new to card collecting, and if this was not the place for questions i do apologize. If you have any advise as to where to go with these types of questions, it would be greatly appreciated..
no comment, but question. 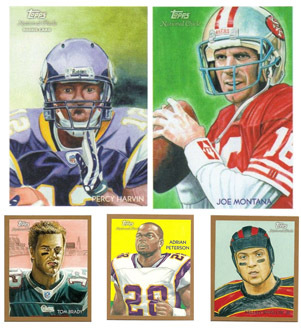 Apologize if this is not the place for questions, I just recently started collection, so if you have tips or suggestions for novice collectors of football cards,ie; where to ask questions etc, that would be much appreciated. Question…started with 09 UD and obtained a Jay Cutler suppose to be numbered in the 30’s but this one is numbered in the 60’s. Has denver emblem on card as well. Appears to me that they combined/mixed thre Cutler and Orton cards. Is this card worth more or less due to this, are all cards produced like this, did they make a correction that i need to look for? again thanks for your time.